We all know how the Slinky walks – but how does it fall? The authoritative article on The Falling Slinky is this one: Modelling a Falling Slinky – replacing it with a chain of masses connected by massless springs and calculating the trajectories of bottom, top and center of mass. Edit: On replying to a comment, I searched for some written explanation by the professor featured in the video: And I found this great scientific paper an arxiv! The wave-like travelling of the “information that tension has collapsed” (as explained in the video) is put into equations. (1) If you are falling down you feel weightless – gravity is equivalent to acceleration. (2) So the Slinky is not subject to gravity when it falls but the elastic force will contract it in the same way a Slinky stretched along a table would do. Now we have to decide on the absolute position of the top or bottom of the Slinky: If it contracts will the bottom move up to the top or the other way round? Or will bottom and top move to the center? I think here we have to resort to considering the center of mass: From the observer’s frame of reference the COM needs to fall down as a point particle with the same mass. The top starting to move will make the COM ‘fall down’ and make the Slinky contract. Actually I came to this conclusion after playing with another thought experiment that did not work out well in the end. I imagined the connection between the individual segments of the slinky becoming weaker and weaker until the Slinky ends up as a pile of separate rings. The rationale for this was that a Slinky is quite a weak spring – but in the explanation given above some restoring force is crucial. The rings would be connected by strings that just keep the whole thing from falling apart. The strings would not be elastic. Thus there is hardly any elastic force, they wouldn’t be any oscillations when the bottom of the ‘string Slinky’ has been released. Now all the rings except the top ring are suspended – each ring connected to its superior. When the top ring is released it starts to fall – there would be no restoring force. I expect this thing to fall without any change in shape – in contrast to the Slinky – if the experiment is done in vacuum and everything is balanced carefully. In real live it would rather twist and tumble. Probably I should test that at Christmas time – connecting ring-shaped cookies with silvery or golden yearn would be both decorative and very close to my mental model. You could also use Christmas cookie cutters and connect them by silvery yarn – or by angel hair. This entry was posted in Physics, punktwissen, Science and Technology and tagged Classical Mechanics, Experiment, Physics in a Nutshell, Physics in Everyday Life, Slinky, Toys by elkement. Bookmark the permalink. If you get an earworm from that, you’re welcome. Theoretically the name should be Slinky in any language (if I trust Wikipedia on this). However, I did not know that there is any name for it in German. But we here in Europe definitely missed this song, I cannot recall any commercials. Slinky is also an actual word in English, meaning “provocative”, as in a slinky dress. According to Google translate the German word would be aufreizend, as in: Aufreizend! Spaß für ein Mädchen oder einen Jungen! which sounds a tad creepy. 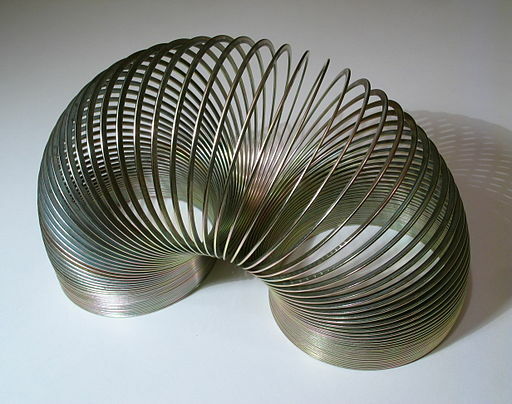 On second though, Slinky probably comes from the verb “to slink” which is roughly translated as “zu schleichen”. So maybe the toy should be called “hinterhältig” in German. By the way, your Google number is now 2. Just Google “Slinky Einstein”. But aren’t both Slinky and Einstein proper nouns and thus not eligible as Google number terms? 😉 You might declare slinky to be an adjective, but Einstein…? BTW with German terms it is rather easy to achieve a Google number of 2 as German gives you infinite options to concatenate nouns without blanks or hyphens – equivalent to the English phrases that would include blanks. This physics post wasn’t as scary as the gyroscope, so I shouldn’t have put it off for a day when I knew I had hours to ponder. 🙂 I can give you some trivial feedback, though. http://www.youtube.com/watch?v=EZL6RGkPjws is the commercial we used to see on TV as kids (the song is very powerful, though, it’s stuck in my head). Thanks, Michelle! I might attempt to write a short update, based on the conversation I had with Dave (Pairodox Farm) below – and try to compress the physics into words even more! I started a reply to this, which turned out to be too long. I think I’ll try to form my thoughts, as they connect to the post you reblogged from Dan, and post it. I’ve found a real-world problem in my children’s educational experiences, and you’ve really hit on the dilemma I’m having, that eventually we must be able to communicate some ideas/problems/solutions in mathematics… it is not enough to have only language-based discussions. This sounds enigmatic, but I’ll try to clarify in the post. Thanks. It’s an interesting idea to transfer the thought experiment to the atomic level – I was thinking of macroscopic metal rings connected by yarn of perfectly fixed length. I guess an analysis of the waves (similar to the one done in the paper) woud yield that they travel through the body extremely quick. I know – these puzzles are terribly deceptive – I am not sure if I would have predicted it correctly. Trying to image what each part of the slinky does I prefer the explanation given by the professor in the video: “The information about the support being lost at the top needs some time to travel down to the bottom”. If the slinky would be perfectly rigid then the information would be “available” immediately at the bottom. The decrease of tension is like a wave travelling through the slinky – so it is not an instantaneous reaction. No problem!! This is not the corporate world – I am not all expecting “timely replies”. I believe you can put physics in words and add clever and concise arguments that can in some sense replace equations. Richard Feynman’s physics lecture are in my opinion the best example for that. But there is a big caveat: Words are actually shortcuts to something that finally has to be expressed in math. If physicists talk about e.g. “a particle feeling a force” etc. they have an equation in mind. You can use language to expound the math and foster the process that lets sink math into your subconsciousness – I believe this is finally not that different from learning a language. But I think the essence of physics cannot be grasped based on verbal descriptions only. It makes me cringe if “quantum physics” in ats verbal form, expressed in new age-y babble or language that can be confused with that – is used to “explain consciousness” for example. I have often observed that popular physics books by notable experts (not written with any spritual metaphysical stuff in mind) are hailed by readers inclined to esoterics. Three forces act on each of the little spheres: the elastic forces exerted by its neighbours and gravity. The tricky thing is that the forces are influenced by the movements. Solving the systems of differential equations means: Calculate the force –> calculate the movement in the first millisecond –> calculate the forces… It’s an iterative process. In the very first moment, when the first (top) “particle” starts to move, you know all the positions of all the particles and all their velocities – all velocities are zero except the one of the first particle. It is true that “gravity acts immediately”, but for the bottom particle it is still compensated be the upward pointing elastic force exerted by its neighbor. So the last particle will not move. If the last one does not move, nothing changes for the particle above the bottom one. The only particle affected immediately is the one below the top particle, because due to the non-zero velocity of the top one the first spring has been shortened and thus the elastic is weaker in the first spring. What a wall of text – sorry! I probably will promote this a blog post in the future! Elkement’s Theory and Practice of Trying Everything has a charming post here inspired by the imagination-capturing question of what happens to a Slinky if you simply drop it (including a slow-motion video showing just how close reality can be to a Road Runner cartoon). She also puts forth an alternate explanation for just what is seen. Slinkies are great physics (and mathematics) tools anyway, as they let you play for a while as you pretend to be working out how to model all kinds of wave motion problems.